EDINBURGH, Scotland, 2017-Nov-03 — /Travel PR News/ — With the UK’s love affair with Mother’s Ruin showing no signs of slowing down, VisitScotland is quenching the thirst of gin fans with the creation of its very first interactive gin map. Taking you on a virtual tour, Scotland’s Gin Map, currently holds details of over 40 producers with more expected to be added in the future. You can explore the spirit by region, find your favourite brands, learn where you can ‘make your own’ gin or embark on a distillery tour. From Shetland’s most northerly isle to Dumfries, there are new distilleries, exciting events and unique gin-themed experiences popping up the length and breadth of the country.The spirit’s increasing popularity, especially for craft and artisan products, is worth around £1.2bn to the UK economy, with that figure set to soar to £1.5bn by 2020. Steve Duncan, VisitScotland Marketing Manager, said: “Thanks to a huge surge in craft spirit production, Scotland’s gin credentials are on the rise. While we may be best known for whisky, we also have a long history of producing really good and award-winning gins, which is clearly borne out by the rise in the number of Scottish producers over the last few years. Some of the world’s best-selling gin brands are made in Scotland and the number of producers is rising every year. Scotland produces 70 per cent of the UK’s gin so if you are looking for some ginuine ginspiration look no further…. One of the youngest Scottish craft gin producers, Beinn An Tuirc Distillers produceKintyre Gin. Based on the beautiful Torrisdale Castle Estate, close to the equally beautiful village of Carradale, the gin is also sustainably produced thanks to the use of hydro-electricity and fresh local spring water. Based in Newton Stewart with an enviable view of the Galloway Hills, this new gin distillery creates tasty spirits using new technology and locally sourced ingredients. Perfection takes time though and over 100 different recipes were tried and tested before creating their gin.This modern and custom-built distillery is now providing tours of their grain-to-glass production process. Fresh from being award Gin of the Year at the 2017 Scottish Gin Awards, the first distillery in Dundee for almost 200 years only opened its doors in April with the launch of its Verdant Dry Gin.It combines a carefully curated blend of botanicals that is inspired by Dundee’s rich trading history, reflecting the routes once sailed by traders to and from the city. Edinburgh Gin, which boasts two distilleries in the capital, celebrates the city’s historic gin heritage with a chance to explore the atmospheric working distillery. If you are new to the delights of the spirit, try the Gin Discovery Tour, learn about the history of the drink and discover Edinburgh’s distilling past. For those who fancy becoming a gin expert then the Gin Connoisseur Tour ends with a tutored tasting of a selection of gins. In another corner of the city, nestled amongst the galleries, workshops, theatres and studios (there’s even a pub in the middle of it) of Summerhall, you’ll find Pickering’s Gin. This small but perfectly formed distillery is staffed by a friendly and passionate team ready to show you around.If you like your gin coupled with a slice of adventure then try your hand at LockedIn the Distillery with Pickering’s Gin– this unique escape gamechallenges gin fans to solve the clues, save the distillery and most importantly save the gin! With a history spanning over 100 years, Eden Mill was the first original single site combined brewery and distillery in Scotland.Its story began at St Andrews in 1810 when the legendary Haig Distillers first laid down whisky at the site. The distillery still honours its links to the Home of Golf by using hickory wood from retired traditional golf clubs to produce its golf gin. Their special gin tours start with a refreshing G&T and continue with a detailed history of the site before ending with a gin tasting session. Best served with a slice of cucumber, Hendricks distinctive infusion of rose and cucumber has earned it universal acclaim. Hailing from the seaside town of Girvan in Ayrshire, the Hendrick’s distillery overlooks the mysterious island of Ailsa Craig. Distilled under the supervision of Master Distiller, Miss Lesley Gracie, Hendrick’s employs two distillation methods to weave local water from the Penwhapple reservoir with alcohol and 11 botanicals sourced from around the world. Holding the title of the most northerly distillery in the British Isles, the Shetland Distillery Company is home to Shetland Reel Gin. The range of island inspired gins produced here are distilled with local apple mint and foraged bladderwrack seaweed and capture the true essence of Shetland. Heritage is the key ingredient of the gin-making process at Kingsbarns Distillery. Darnley’s Gin is made in a traditional pot still using the centuries-old London Dry method. They make their gin this way, as it pulls on the heritage and skills of their master distiller and produces a gin with uncompromising quality and flavour. Learn all the secrets by taking one of their gin tours. Located in the spectacular Bay of Dunnet in the far north of Scotland, this distillery is becoming a popular spot for those touring the North Coast 500 route, Scotland’s equivalent to Route 66. Rock Rose gin gets its wonderful flavour from a carefully selected combination of local and traditional botanicals. Each one meticulously chosen for their flavour properties to create the perfect taste. Lilliard Gin is made in and inspired by the heart of the Scottish Borders. It is made with ingredients which can be found just outside the distillery and is intended to reflect the soft rolling hills of this part of the Teviot Valley. As well as weekend tours, you can also enrol in their special Gin School to create your very own gin. For that true farm-to-bottle experience, pay a visit to Lunan Bay in Angus, home of Arbikie Distillery, where the team distils their spirit from scratch, using potatoes and wheat grown on the farm. Named Scottish Gin Distillery of the Year at the Scottish Gin Awards 2017, Arbikie produces two gins. Named after the distillery’s Master Distiller, Kirsty’s Gin is a smooth gin with floral and citrus hints – best served in a G&T garnished with blueberries. AK’s gin has an earthy and spicy flavour – local honey adds a smooth sweetness. Based inside one of Scotland’s best cocktail bars, Langstane Distillery is a unique micro-distillery focusing on a modern style of ‘cold’ distillation. This is the home of Porter’s Gin, and is Aberdeen’s first gin distillery in over 100 years. The small team also partner with the UK’s oldest gin distillers, G & J, to distill some of the spirit. This partnership is fundamental to Porter’s, which combines modern and traditional techniques to create a ‘modern classic’ style of gin. Vibrant and exciting, just like its home city, Makar Original Dry Gin is the first super-premium gin to be distilled in Scotland’s largest city, Glasgow. Deriving its name from the ancient Scots word for ‘the maker’ or craftsman, the attention to detail when producing this handcrafted gin spreads right down to its presentation in a seven sided bottle representing seven distillations and seven carefully selected botanicals. 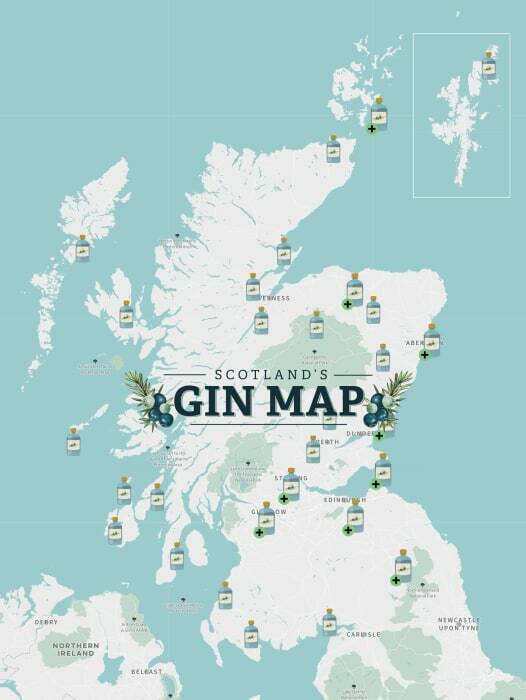 This entry was posted in Attractions, Food & Drinks, Tourism, Travel, Travel Marketing, Travel Services, Travel Tech and tagged gin fans, interactive gin map, Steve Duncan, VisitScotland. Bookmark the permalink.